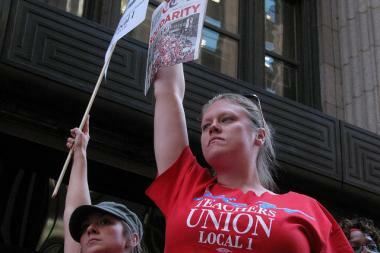 Chicago teachers could repeat a 2012 strike if no contract is reached and their pay is cut by a pension obligation. RIVER NORTH — The president of the Chicago Teachers Union threatened a strike Friday after Chicago Public Schools abruptly rebooted talks on a contract extension. CTU President Karen Lewis said teachers could take a strike vote at any time, although state statutes would most likely delay a walkout until the winter. Primary among the issues was the demand from Chicago Public Schools that teachers pay their entire 9 percent pension contribution, after previously paying 2 percent with the district making up the difference — a negotiated contract concession dating back to the '80s. Lewis said paying the full contribution would amount to a 7 percent cut in take-home pay. "To take a 7 percent pay cut would be strike-worthy," Lewis said in a news conference at CTU headquarters in the Merchandise Mart. 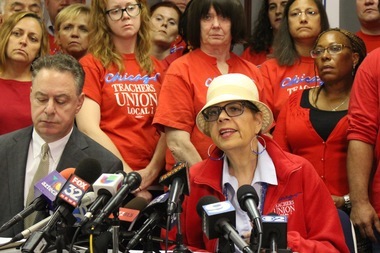 "To take a 7 percent pay cut is strike-worthy," says CTU President Karen Lewis. "Seven percent is huge," she added. "It's not acceptable to our members." CTU estimated the cost of the so-called pension pickup at $140 million annually, or about $4,000 to a second-year teacher making $55,000. Lewis said she was shocked that talks on a one-year contract extension broke off Thursday, when CPS suddenly changed course and took a one-year deal off the table to seek a new multiyear contract. "Withdrawing this one-year contract is simply wrong," Lewis said, calling it "disingenuous, disturbing and destructive." "That room was frozen when we walked in there," Lewis said of Thursday's negotiation session. "They were a little upset themselves," she added, because all had thought they were close to a deal. "We were on the verge of reaching an agreement," said CTU attorney Robert Bloch. "Unfortunately, we must now go back to the drawing board and start over again." According to Bloch, CPS negotiators rebooted talks "for reasons only they know." "CPS remains dedicated to reaching a multi-year agreement with our teachers that respects their hard work and protects the academic gains that they've helped our students achieve," said CPS spokeswoman Emily Bittner on Friday. "We will continue to negotiate in good faith at the bargaining table to reach an agreement on a broader and longer contract that is beneficial for our children, their teachers, the taxpayers and the entire system. However, we will not roll back standards for teacher performance, and we will make sure that our highest-performing teachers can continue to serve in classrooms." Lewis laid the new snags at the feet of Gov. Bruce Rauner, Mayor Rahm Emanuel and new CPS Chief Executive Officer Forrest Claypool. Rauner offered CPS a deal Thursday, if it reins in the union. Lewis rejected that and the new CPS negotiating posture, which she suggested was instituted by Claypool. "Mr. Claypool is the latest sheriff who seems to believe it is his or her responsibility to ride into power and show the teachers and other school employees that he's going to dole out harsh and disrespectful treatment," Lewis said. "Gov. Rauner's insistence that Chicago teachers take a 7 percent pay cut is short-sighted and seeks to punish workers who did nothing wrong. "I'm not confident about anything when it comes to politics," Lewis added. She said a strike or any other work action "will be decided by our members at the appropriate time." She accused Claypool and Emanuel of courting a work stoppage, saying, "If Mr. Claypool and the mayor are telling the city's public-school educators to go on strike, then they should just come out and say it." According to Lewis, CTU would most likely wait for rank and file members to return for the start of school next month to initiate serious debate about negotiations and a possible strike. Bloch said a strike vote could come at any time, but that "statutory processes" in state law would delay a strike "several months" until winter. Until then, Lewis said, CTU will continue to talk. "I'm trying to be good," Lewis said. "We're still gonna negotiate. We're not done."